It must be seen in person to be truly appreciated. 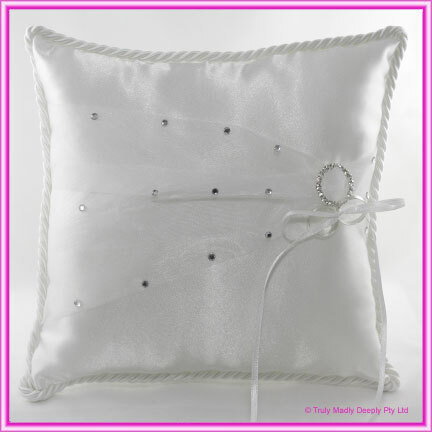 It features a lovely white satin cushion with white roped edges. There is a large white organza sash that is adorned with glittering diamantes and gathered on one side. It is then finished with with a round diamante buckle. The buckle is a quality product with glass diamantes and set in a metal clasp that doesn't tarnish. Matching Flower basket also Available for the Flower Girl. See below for details.